With our products we seek to create high quality and technologically sophisticated solutions in various contexts. This is another reason why we are pioneers in the realisation of the potential of LED technology. Since every individual project poses specific challenges, we have developed a technology with which we can adapt to them down to the very last detail. 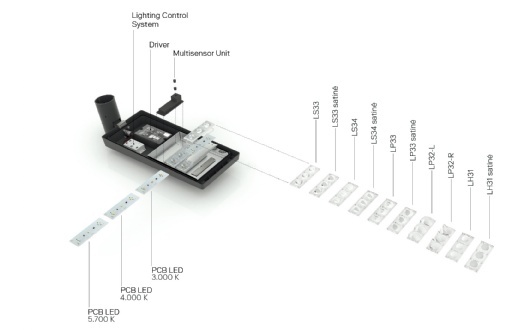 A modular and highly variable LED lighting unit serves as the basis of ewo’s lighting systems. Its geometric dimensions remain the same in every possible configuration. As a basic building block, it can be implemented in systems of any chosen size – from bollards to high-mast systems. – The lighting unit consists of a lens block with three lenses, an LED module with high-performance LEDs, a gasket for IP protection and a heat dissipating mounting profile that allows for flexible adjustments­ within the light fixture. – The distribution of light results from the choice of optical lenses. Different radiation characteristics can be chosen – for streets, squares or walkways, use in high-mast systems or bollards. By using satiné versions, the illuminated area takes on softer contours. – The color of the light is a function of the LEDs chosen. Three colors are available for different atmospheres: cool white (5,700 K), neutral white (4,500 K) and warm white (3,000 K). – The amount of light is determined by the number of lighting units used. The modular concept makes gradual adjustments possible so that only as much light is produced as is required with commensurate savings in terms of consumption. – The lighting units within a lighting fixture can be adjusted to different angle independently of one another. – Operating equipment can be programmed differently. We use this to adjust how the overall product functions to accommodate the most diverse contexts. Interfaces are also available for the integration into light management systems.